Apologia Educational Ministries is our favorite source when it comes to science curriculum. 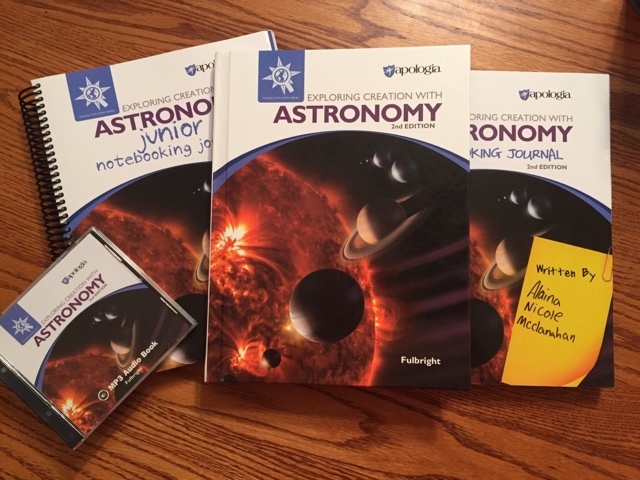 Alaina has been using Exploring Creation with Astronomy, 2nd Edition and she thinks it is her favorite science class she has taken. Exploring Creation with Astronomy, 2nd Edition is the new and revised edition of Apologia's award-winning astronomy course. Students will see God's great wonders using the Charlotte Mason method. The course tours the universe by starting with the sun and planets then explores the galaxies, nebulae, and the black hole. We received four components of this curriculum and there is now a science kit that can be purchased to supplement the course. Student Text ~ This is a hard back book with beautiful colored pictures throughout. There are 216 pages divided into 14 lessons. The lessons vary in length, and they all contain activities to make science real to K-6 grade students. The text is written directly to the student and contains a lot of colored photos and text boxes. The text is very engaging and shows the majestic power of God. There is a complete supply list for each lesson and the answer key included in the appendix. The supplies needed for the activities are all very common household items. Looking ahead at the entire list the only thing we will need to buy is 2 plastic bottles and I'm sure the kids will not complain about drinking a soda to get those. Notebooking Journal ~ This spiral bound journal is 336 pages. The front of the book contains a suggested daily schedule for each lesson. There is plenty of space for the student to write everything they are learning from the text and what it means in their lives. 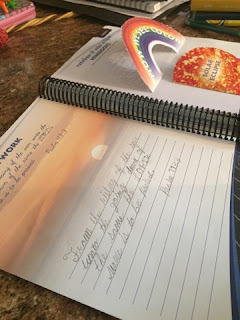 There are also colorful mini books, scripture copywork, vocabulary review, review questions, and a place to document the activities. Junior Notebooking Journal~ This journal covers the same things as the regular journal, but is recommended for beginning writers. 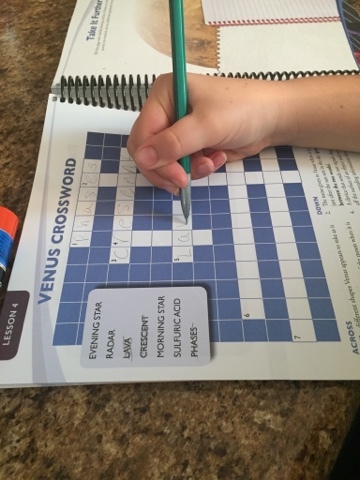 The crossword puzzles already have a few letters filled in, and there are pictures to color instead of pages for the student to write down what they remember like the regular journal has. Audio CD~ This is a MP3CD which can be listened to from a computer or a MP3-compatible CD player. It is a recording of the complete course read by Jeannie Fulbright, the author of Exploring Creation with Astronomy. This is perfect for children who are slow readers, or just like to follow along in the text while they listen. Book Extras ~ There are extra materials available from Apologia that enhance this Astronomy course. There are links to biographies, satellite trackings, images of planets, articles on how to choose a telescope, and even careers in Astronomy. Astronomy 2nd Edition Science Kit~ This is brand new and has only been available for a week or so, and it is currently 15% off. We did not receive this, but it looks wonderful. It contains a Science Kit Guide and all the products (except food items) you will need to complete the activities in the Astronomy text. The supplies are clearly labeled with each activity number so you can just grab it and get started. Alaina is 11 and has been using Apologia Astronomy for her homeschool science curriculum. Normally we study science and history together and I just require more from the older two girls than from Alaina. She was thrilled to have a different science book this year than the other girls, and of course they are using Apologia Exploring Creation through Biology, 2nd Edition. 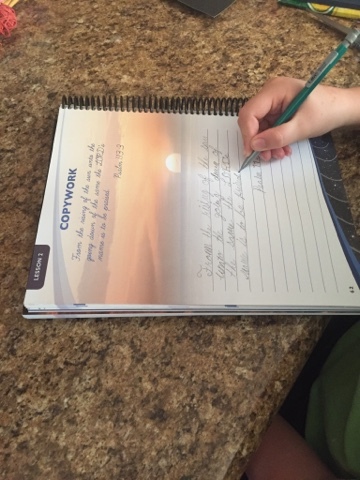 Alaina has been using this every day for school, she loves having the Suggested Daily Schedule at the front of her Journal, so she can check off every thing she has completed and it helps her to stay on track with her work. The Notebooking Journal is just right for Alaina. She still loves to make lapbooks, but I think she needs to start writing more than what she does when she is coloring, cutting and glueing in her lapbooks. That is one reason we both love the Notebooking Journal that goes with the text book. There is a good mix of writing and mini books that she can cut and glue into her journal. She still loves to color and since we also received the Junior Notebooking Journal she has been coloring the pictures included in it. Although Alaina has been reading the text herself everyone wanted to listen to the audio CD at least for a little bit because they have seen Jeannie Fulbright's name on their science books for years and they all wanted to know what she sounds like. The recording is very well done. Jeannie speaks in a clear voice and she sounds like she really enjoys reading the text. This is the activity for Lesson 1. 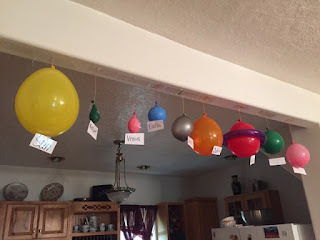 Alaina loved blowing up her balloons to make her solar system. In her Notebooking Journal she recorded what she did and what she learned from this activity. She loved the mnemonic that was included in the text book and enjoyed making up some of her own. We have used so many products from Apologia over the years and we have the Field Trip Journal that is an ongoing journal. We will record any Astronomy field trips we take this year in this journal. Astronomy has been a huge hit with Alaina this year and she wants to work on it first thing in the morning. I know she has been enjoying it and learning from it, because she gets excited over things she is learning and wants to tell everyone.